Who Was Eunice In the Bible? 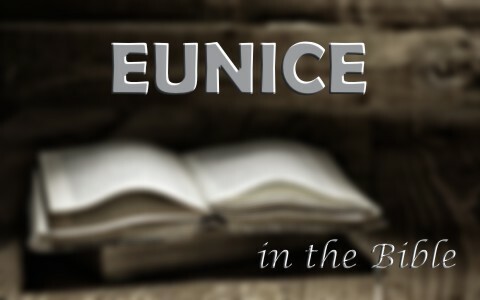 Who was Eunice in the Bible? Why is it important for us to know who she was? Even though Timothy was taught the Scriptures by his mother, even from an early age, he was apparently not saved through his mother’s witness. We know that Paul remembered Timothy with tears (2 Tim 1:4) possibly because he had led him to faith in Christ and considered himself to be Timothy’s spiritual father as he wrote “To Timothy, my beloved child: Grace, mercy, and peace from God the Father and Christ Jesus our Lord” (2 Tim 1:2). It appears then that Timothy’s mother and grandmother watered and Paul fertilized and God gave the increase of Timothy’s salvation. Paul may have also led Timothy’s mother and grandmother to saving faith because there are some hints in regard to this (Acts 14:6-7). Timothy’s early exposure to Scriptures show that teaching children from an early age is so important, even if there’s no apparent interest yet in the child’s being saved. We are commanded to train children up in the Lord (Prov 22:6) and leave the results up to God. Timothy must have known the Scriptures well because Paul wrote “as for you, continue in what you have learned and have firmly believed, knowing from whom you learned it and how from childhood you have been acquainted with the sacred writings, which are able to make you wise for salvation through faith in Christ Jesus’ (2 Tim 3:14-15). Timothy’s mother, Eunice, and his grandmother Lois must have lived lives that pleased God. In the first place, they knew the Scriptures well enough to teach them to Timothy (2 Tim 1:4-5) and he must have known them well enough to become an evangelist, which he did (2 Tim 4:5). If we can learn one thing from the record of Timothy and his mother Eunice, it is that teaching children at an early age will educate them in the Word of God and we know from Scripture that God’s Word will certainly not be without effect on the hearer and reader (Isaiah 55:1). Put it this way; it takes a person of God with the Word of God joined with the Spirit of God to make the children of God for the glory of God. In this way, God rightly receives all the glory. Most Christians are saved at a very early age, most of them under the age of twenty one, showing the extreme importance of children hearing and being taught the Word of God. This is a 24/7 job as God commands parents and/or caregivers; “You shall teach them to your children, talking of them when you are sitting in your house, and when you are walking by the way, and when you lie down, and when you rise” (Deut 11:19) which just about covers the 24-hour clock and seven-day week. Thank you for this timely article, pastor Jack! I was just discussing the importance of raising children in the knowledge of the Lord, with a beloved sister in Christ Jesus recently. I appreciate your confirmation of our conversation, and links to Scripture on this important topic. Please join me in praying Psalm 100 this week, as we thank the Lord Jesus for all of the good He is doing in our lives, and the lives of others. I am thankful for the work He is doing through you. What a rich blessing you are to those around you! Thanks Brother. I love your choice of Psalm 100. One of my favorite positions is to be on my face or on the floor prostate to read His Word. We have muchhhhhh to be thankful for brother and you are one person that comes to mind to be thankful for. Previous post: Why Does The Bible Repeat Stories?